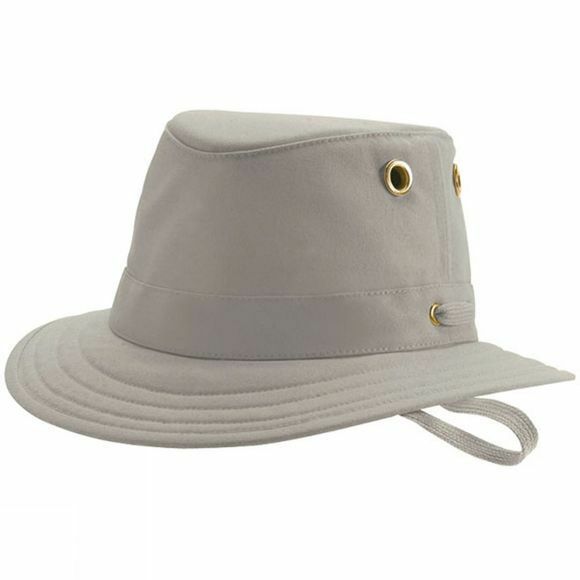 A stylish sun hat for wearing in towns and cities as well as under a hot Tunisian sun. The higher crown increases ventilation. To find your hat size, use a tape measure and draw it right around your head. For the best-looking and most comfortable fit, please make sure that the bottom of the tape touches your eyebrows while resting straight around your head. Hold it there comfortably and do not pull tight! The Tilley Hat fits more comfortably than other hats. It’s designed to be worn low on your head and slightly loose. It should be held on by gravity, not by painful pressure on your forehead! For the proper fit, you should be able to easily insert two fingers, flat, between the middle of your forehead and the front of the Hat. The Hat should be loose enough that you can rotate it to the left and right, and lift it up and down, without friction on your forehead. When it’s windy, use the cord!